Hello! I am back with my next Baukjen blog- cunningly timed to coincide with their first drop of the spring season!! This month’s addition has a two-tier delivery; the first is specific advice on what would work for common challenges and the other is on “investment pieces” I would recommend. I see these blogs as really trying to deliver what I get asked about most. It would be all too easy for me to use them to indulge my passion for fashion and just list lots of gorgeous items for us to collectively salivate over (which I might add is a very tempting approach!). However, in my opinion, that doesn’t add enough value for the reader (or for the brand) and that isn’t what I am about. I am not just a fashion blogger. I have the expertise and I want to share that with you to support you in making the right choices for you from collections so that you wear their clothes with pride and return to buy again. So, for the first section I going to focus on “how to flatter problem areas” guidance; what will work for a shorter leg / fuller bust / wide hip / narrow shoulders / broad shoulders and I have chosen specific items from the new collection that should help rather than hinder these annoying challenges we all face. The theory is- you are looking for a lower neckline to “cut” yourself from top to bottom rather then left to right (which can create “the shelf”). You are also looking for fabric that will “bend” around your curves. The Eleanor Tie Top is simple and uncluttered.The ties bring the eye to the middle and down the front so will make the torso look narrower. Be careful the ties don’t get pushed out too much by the bust and then swing about as that will draw attention to the bust rather than away from it. If you are conscious about cleavage- wear a cami underneath and don’t forget a fabulous necklace to bring the eye line up to the neck. A bright white like this will work for those of you with light colouring. If it isn’t a great colour for you on its own- then pairing with another colour that is better for you will always help. You can do this either in a necklace, earrings or a jacket. The Faith Top is a total classic- the cross over V-neck allows for space for the bust and the fabric will flatter rather then add bulk. This top will work for those of you with a defined waist too. Easy to dress up or down so lots of end wear options for maximum price per wear! I would look for uncluttered, slim and obviously a not too long a style… One of my most favourite of their trouser styles is the Boyfriend Jeans. This style is usually really hard for people who have short legs are there is often too much fabric and it will drown them and make the legs look shorter. However, this style is brilliant and just SO comfortable; not too tight, not too low, not too baggy….the perfect combination! The sizing is generous so either order what you are if you don’t want them too slim fitting, or size down. The Serena Dress is a dream for those of you with hips wider then your shoulders as the slash neck will make them look broader and therefore help to balance your shape out. The fabric will bend around your curves easily too – therefore adding no further width. It is an easy style to shorten if you need to due to the fabric and cut. A classic, timeless dress that is so simple to dress up with high heels, a fitted bolero jacket and accessories or dress down with a fitted denim jacket and wedges. This is what is known as a staple item!! 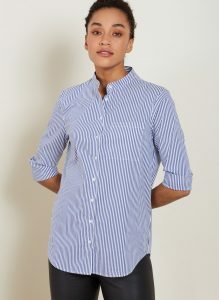 I always advise clients to broaden their top half if they have a small bust- with stripes and lots of details. 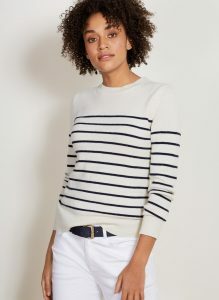 So the Coco striped jumper is perfect – I also love the quality of Baujken’s knitwear- it really does last. Investment Pieces- its all about the leather! There are SO many reasons why a biker jacket should be a staple item in most people’s wardrobe.. It instantly modernises classic items; think white tee shirt, black jeans and trainers…add the biker and suddenly you feel “cooler”. It will work well over waisted skirts and dresses. So instead of wearing a “cardy” over the top of these (because you are wanting another layer) and feeling distinctly average (and possibly a bit frumpy)…a biker jacket will provide all the warmth and none of the frump! Dark hair, dark eyes: all of them! I was wearing this jacket yesterday on Instastories – so if you want to watch and see what its like up close- have a look at the “Baujken Highlights on my profile page. 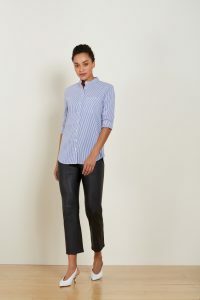 I also love the cropped leather trousers as they are a slightly more updated style in case you were wanting something different from classic skinnies. These are great for summer and for those of you with a shorter leg- just make sure you wear with heals. Or you might prefer the full length version – which will work all year round! A great style and not super-skinny so a little more forgiving! I hope that has helped you an given you some inspiration as well as some tangible advice you can work from in order to chose wisely from their collection. I have a code of “KE20” which gives you 20% off until 15th February- so this gives you a few weeks to make your choices! If you have any questions or comments about this- please do let me know. If you have found this helpful- the more people who let me know this, the more likely it is that the team at Baujken (and hopefully other fashion brands too) will continue to use me to help you. Further to this if you have any comments you would like me to pass onto the team at Baujken- please just send them over. They are so ready and willing to listen to what their customers want that feedback and any thoughts are all so welcome!